WE LOOKED TO the west across the vast plain that lay at our feet, far below the high summit we had recently ascended by ski lift. An ominous wall of darkness rushed toward us, enveloping everything in its path. Someone muttered, “Sauron, the Lord of Darkness, comes now in all his might!” We all then turned from this foreboding view to the sky above to watch the most astonishing and spectacular event in all of nature. This was the moment for which the two of us had been preparing for seven years. Totality had begun for 200-plus Pomona College alumni, their families and friends, in the Pomona College Solar Eclipse Reunion of 2017. 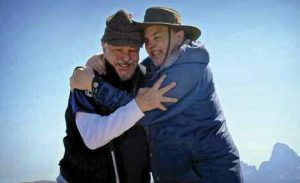 A hundred families, all of whom shared some connection to the Pomona College Classes of ’64, ’65 and ’66, had assembled atop Fred’s Mountain in western Wyoming. We had flown or driven to the area in the days before, ridden a mile-long ski lift to the top of the peak and watched with growing excitement as the dark disk of the moon gradually ate its way across the surface of the sun. In just over two minutes, the total portion of the eclipse was over. Light began to return to the sky. Laughter and excited chatter filled the air. Some of us wept from the pure joy and power of the experience. We, the authors of this article, are identical twins, both graduates of Pomona College in the Class of 1965. Back in 1991, after jointly experiencing an awesome six minutes and 45 seconds of total solar eclipse in Baja Sur, Mexico, we began thinking about a good place to view the eclipse that would pass completely over the United States on Aug. 21, 2017. About seven years ago, we began to deploy what was then a relatively novel tool, Google Earth, to find an ideal spot for viewing the 2017 eclipse. We plotted the path of totality across the U.S. and then began “walking across the landscape” at high magnification, starting on the Pacific coast. We came first to a fire lookout tower in central Oregon, smack on the path of totality, but a long, difficult hike from the nearest Jeep trail. We kept looking. The Palouse region, east of the Cascade Mountains, looked promising from a standpoint of cloud cover — the nemesis of all eclipse watchers — but the landscape was tedious. Moving farther east, just as our digital exploration crossed the state line from Idaho into Wyoming, we found a ski lodge. The more we looked at this location, the more interesting it became. 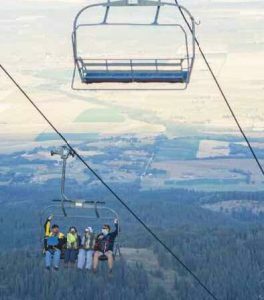 The resort sat at 8,000 feet, at the base of a 10,000-foot peak called Fred’s Mountain, with a chair lift to the top. Just east of Fred’s Mountain rise the magnificent peaks of the Grand Tetons. This skier’s paradise, we realized, might provide a truly unique eclipse-watching opportunity. 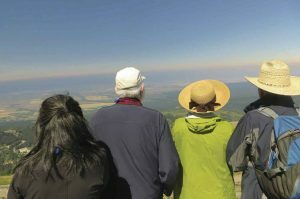 From atop Fred’s Mountain, with very clear air, one might be able to see the shadow of the moon racing across the 100-mile-wide valley floor below. We calculated that at 1,662 miles per hour, it would take only a bit more than three and a half minutes to cross that breadth, all in view from our aerie-like perch. After kicking around various ideas for how best to make use of this seemingly unique site, we decided—shortly before the 50th reunion of our Pomona Class of ’65 (Thor)—to see if our classmates would be interested in an informal class reunion built around the eclipse. The response was enthusiastic. With a goal of completely filling the resort’s 95 rooms, we first solicited sign-ups from our classmates and then expanded the proposal to our two “adjacent” classes, ’64 (Dionysus) and ’66 (Pele). And so we brought together the god of thunder, the god of wine and ritual madness, and the goddess of fire, volcanoes and capriciousness—quite a volatile mix. From those three classes, we drew enough participants to fill the entire ski resort, counting spouses, children and grandchildren of classmates. Then came two years of intense planning, including two inspection trips to the resort, negotiations over fees, menu planning for group dinners, contracts with vendors, identifying speakers (what would a Pomona gathering be without strong intellectual content?) and much more. We even included four nights of “star parties”—opportunities to view gorgeous objects in the night sky through telescopes operated by experienced amateur astronomers— organized by Franklin McBride Marsh ’17. We approached the resort’s management well before they had a clear sense of the enormous enthusiasm that would later emerge for the Great Eclipse of 2017. Thus we were able to negotiate a very favorable deal—a four-night-minimum stay at only modestly higher-than-normal room rates. 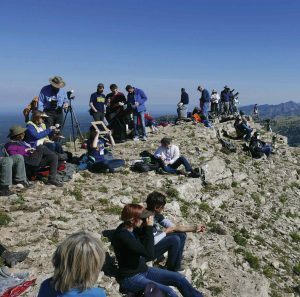 In the months just preceding the eclipse, commercial tour operators were asking—and getting—three or four times as much per person in nearby Jackson Hole, Wyoming. On eclipse day, rooms in a Motel 6 in nearby Driggs, Idaho, were going for $1,000 a night. 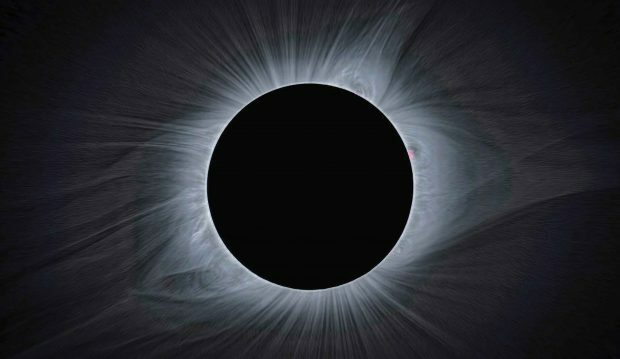 In the last year before the eclipse, as people began to focus more on the upcoming event, the resort’s marketing team received inquiries from numerous other groups, including eclipse-chasers affiliated with Brown and Oxford universities. Sadly for them, but happily for us, Pomona College got there first. For our speaker series, Pomona College sponsored two Pomona faculty members—Professor of Geology Robert Gaines and former Brackett Professor of Astronomy Bryan Penprase. And from the ranks of our alumni, we added Ed Krupp ’66, director of the Griffith Observatory in L.A.; Larry Price ’65, part of the team that proved the existence of the Higgs boson with CERN’s Large Hadron Collider; Barbara Becker, historian of astronomy and spouse of Hank Becker ’66; and James A. Turrell ’65, the world-famous artist who manipulates light and space. The Phelps twins have made electronic presentations from the reunion’s speaker series available to donors who give $47 or more to the Phelps Twins Solar Eclipse Fund for Science Internships at Pomona College, created by reunion participants following the event. The presentations, which combine audio recordings with synchronized copies of the accompanying PowerPoints, include “Aliens in the Ooze,” by Pomona Geology Professor Robert Gaines; “Chasing Cosmic Explosions,” by former Pomona Astronomy Professor Bryan Penprase; “Devoured by Darkness,” by Ed Krupp ’66, director of the Griffith Observatory; “The Scientific Discovery of the Century,” by physicist Larry Price ’65; “Risky Business: The Search for the Soul of the Sun in the Shadow of the Moon,” by historian of astronomy Barbara Becker; and “The Art of James Turrell,” a conversation between Krupp and noted light-and-space artist James A. Turrell ’65. To our considerable relief, the morning of the eclipse dawned with almost completely clear skies. You can plan for a thousand details, but there is no way to control the weather. 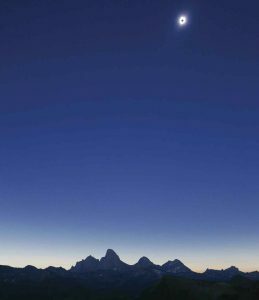 We had selected the site in western Wyoming for two reasons—the unique view and the area’s encouraging history of mostly clear skies in late August. The historical record proved predictive, but if the eclipse had occurred four days earlier or three days later, we would have been rained out, so we were also lucky. On eclipse day, the air to the west was darkened by smoke from vast forest fires in the Pacific Northwest. As it turned out, however, the smoke enhanced our eclipse experience. Thanks to the haze, the lunar shadow presented itself to us as an immense 60-mile-wide wall of darkness (some saw it as a wave) that seemed dense, solid and impenetrable. The sight of what appeared to be a huge physical mass moving toward us at twice the speed of sound was awesome—indeed, frightening—and even more dramatic than we had dared to hope. As we stood there at the only vantage point in the world where that unique view was available, we couldn’t help imagining what the experience might have been like for people before science provided an understanding of the event. Lew and Chuck Phelps, both ’65, embrace at the end of the event. Photo by Alex Bentley and Hunter Bell. The appearance of the sun during totality is as different from a partial eclipse as (literally) night is from day. All the phenomena one hopes to see during totality made an appearance atop Fred’s Mountain. The glorious halo of the solar corona was much more expansive and detailed than the two of us recall from the 1991 eclipse we saw in Baja Sur. Atop Fred’s Mountain, we observed Bailey’s Beads, the fiery red dots that appear on the rim of the moon at the beginning and end of totality as the sun peeks through valleys in the mountains and craters that rim the moon’s edge. The “diamond ring” apparition as the sun emerged from behind the moon was spectacular. Our bodies’ shadows became extremely sharp-edged as the sun became almost a true “point source” of light just before totality. A beautiful magenta aura caused by prominences erupting from the sun’s surface appeared just before totality ended. Alas, the shimmering and beautiful “shadow bands” that can appear just before and after totality were not much in evidence on the summit of Fred’s Mountain, although more-so to several dozen of our group who stayed at “base camp” at the resort to watch. Such is the power of a total solar eclipse.